Pallet shelving systems are designed to store pallets that are usually accessed via forklift trucks or picking cranes. 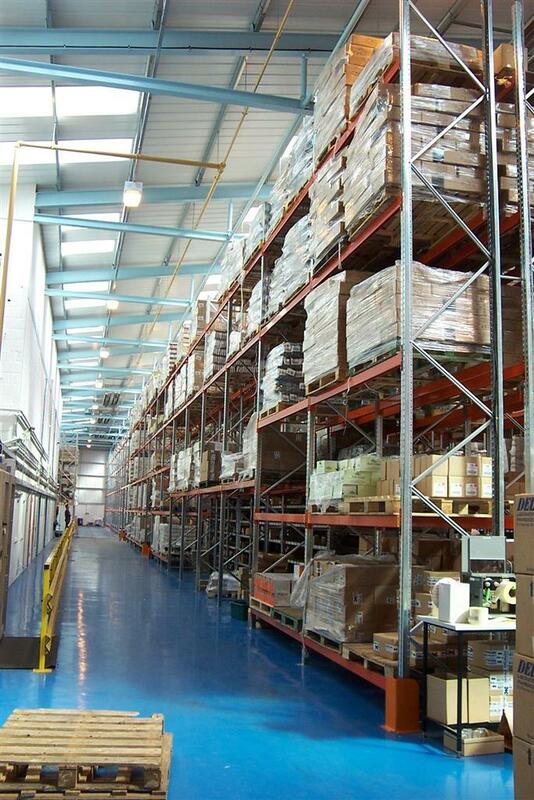 Hampshire Mezzanine Floor can design, supply and install pallet racking systems that meet the needs of your commercial environment. We are experienced in fulfilling requirements and fitting pallet racking systems to a high standard for a variety of businesses across the UK and Channel Island. Using our in-house AutoCAD design capabilities, we can ensure the full utilisation of your available storage space in your premises. HMF have been in partnership with Dexion for over 25 years, successfully installing the world’s leading Pallet Racking systems and servicing existing Pallet Racking installations. These high-quality systems are robust and are the perfect solution for increasing capacity, productivity and efficiency within your commercial environment. It is important that you determine the best system to maximise the space of your installation. Your choice of pallet racking will be determined by the quantity and size of pallets in combination with the level of access required. You will need to consider how your products are stored; for example, are your products stored on a long term basis or do you need to operate a first in last out system? Dexion Speedlock P90 Pallet Racking complies with European FEM, DIN and INSTA codes, so you can trust Dexion for all types of warehouse applications. There are various racking systems available including narrow aisle pallet racking, pallet live storage, push back pallet racking, adjustable pallet racking, carton live storage pallet racking, vertical arm cantilever pallet racking and many more. 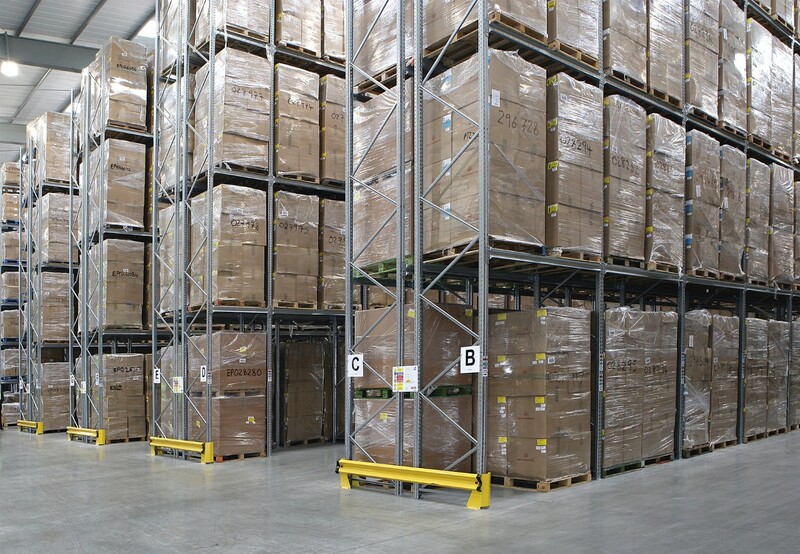 Adjustable Pallet Racking (APR) is designed for normal small to medium warehouse environments. Narrow Aisle Racking is designed for increased density by minimising aisle widths with Narrow Aisle or Bendi trucks. Drive-in Racking is designed for bulk storage where limited accessibility is required. Push Back Racking is designed for storage density but can be accessed by non-specialised fork trucks. Pallet Glidestock Dynamic Gravity Racking is usually used where pallets need to be collated in picking lines ready for dispatch. We truly care that you are making the most of your space as well as your budget. We will work with you to design a system that is efficient, whilst meeting the needs of your business. 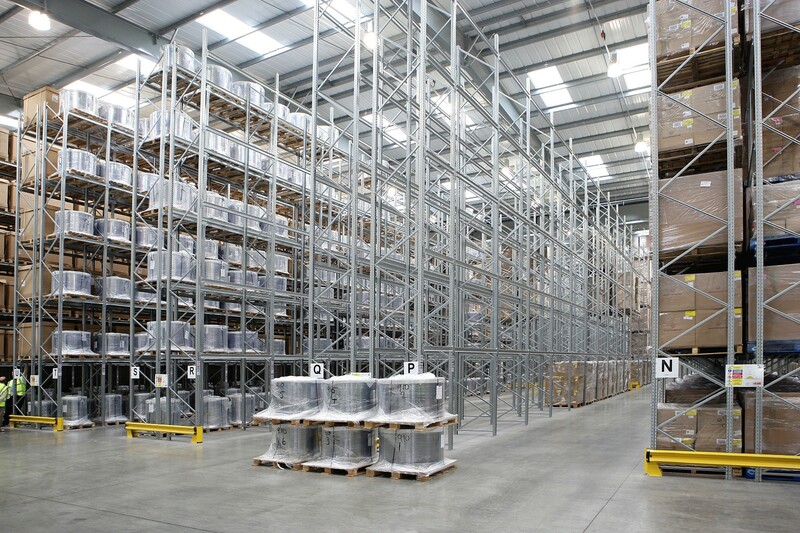 Hampshire Mezzanine Floors will design the right pallet racking solution for your specific requirements and will advise you on safety features, rack protection, fork truck requirements and anti-collapse mesh. Additionally, HMF offer a rack maintenance inspection service to check the safety and extent of damage to your racking. We will provide a safety report for your records and quotation for any rack repairs we feel necessary to maintain the safety of your warehouse. 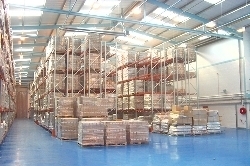 For more information on pallet racking systems, please contact us.